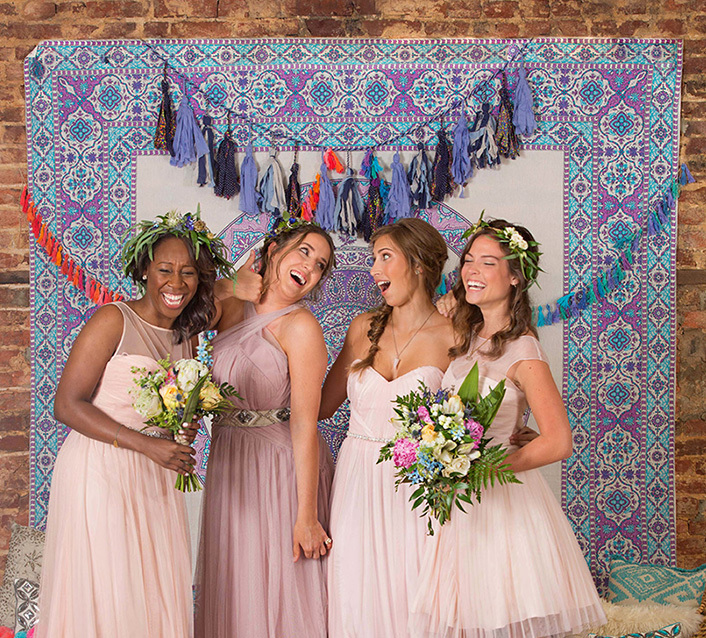 We paired drop-dead gorgeous dresses with all that’s great about being a bridesmaid: friends, flowers, and fun. 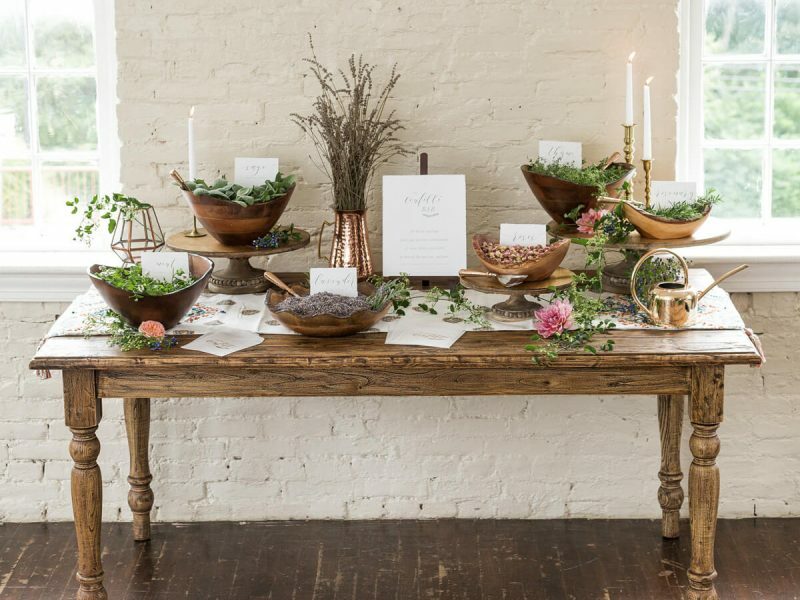 Styling and production by Jessica D’Argenio Waller and Paola Albergate of MAKETRIBE with Allie Rosenwasser. 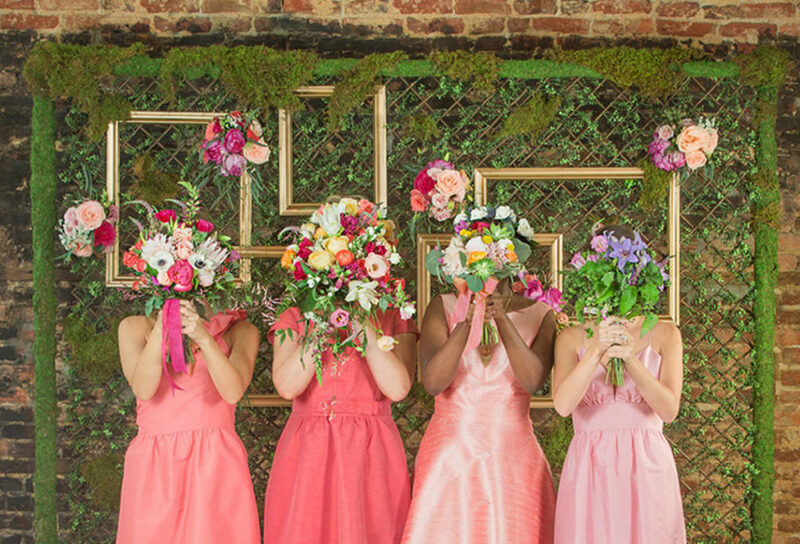 All florals, including bouquets, hairpieces, and backdrops by My Flower Box Events. Hair and makeup by Behind the Veil. Open-air photo booth from Pixilated Photo Booth. 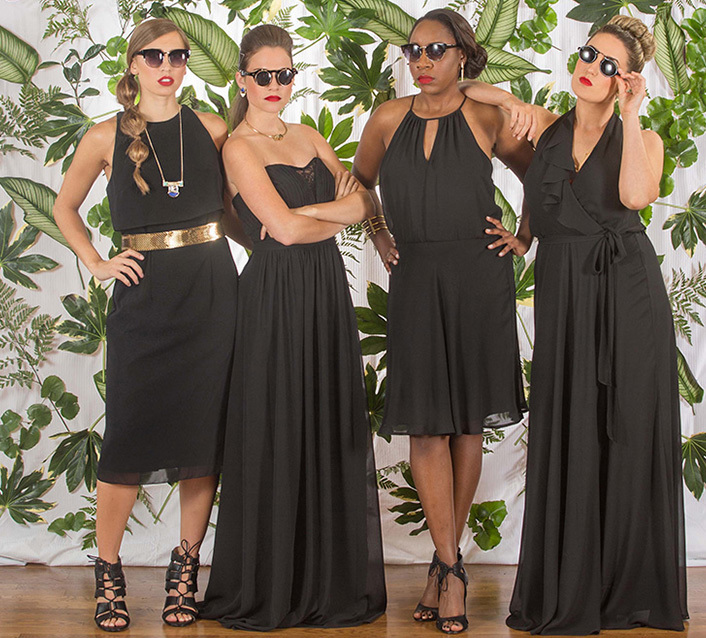 Models, from left to right: Kristina Beese, Aandria Carr, Emma Fesperman, and Alexis Blair. Shot on location at The Chesapeake Event Space. 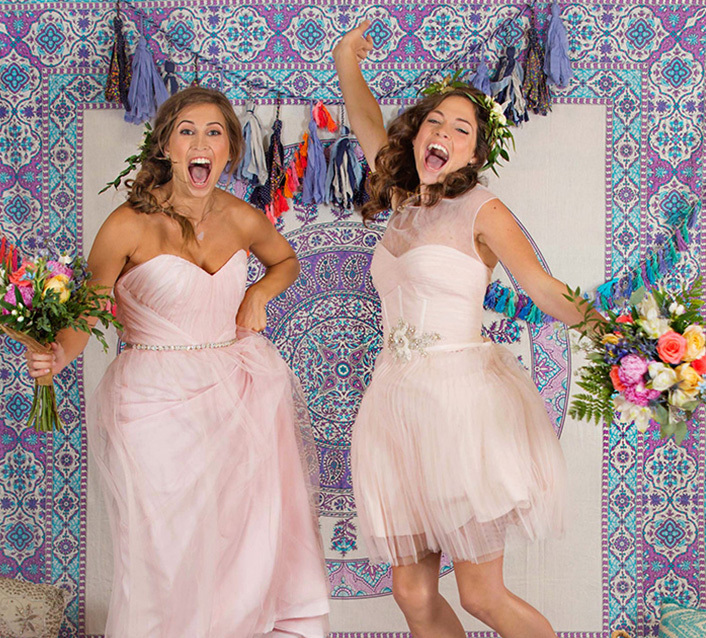 On Kristina: LulaKate ruffle-one shoulder Bridget dress in coral ($225-240) at Bella Bridesmaids. Repeat Offfender gold-plated steel 3D printed ring ($56.95) at Doubledutch Boutique. Loeffler Randall classic Pari pump ($325) at Sassanova. On Aandria: Alfred Sung coral tea-length peach-pink taffeta dress ($168) at Bella Bridesmaids. Gold-tiered necklace with peach-fringe tassels ($24) at Hunting Ground. Green rectangular dangle earrings with rhinestones ($19) at Poppy and Stella. Corso Como Twilight sandals ($164) at Poppy and Stella. 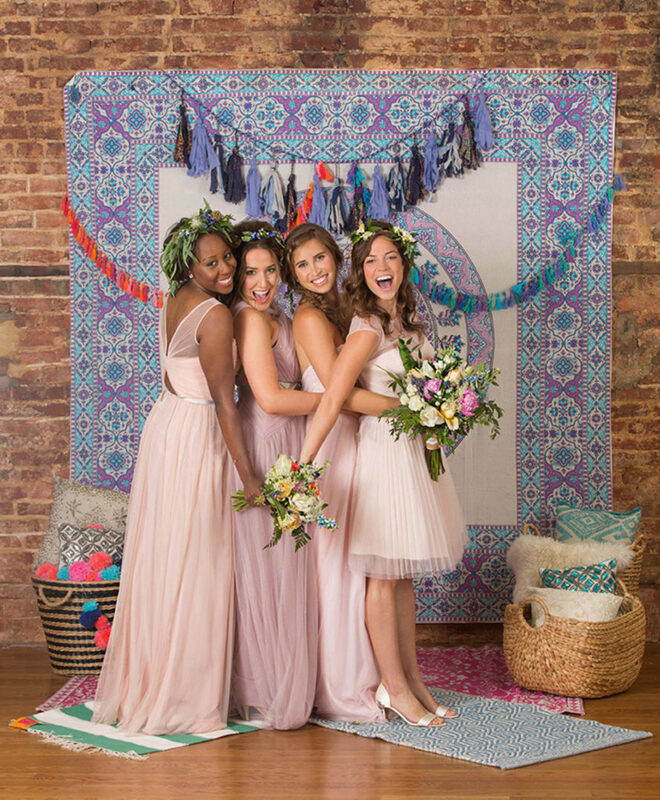 On Emma: LulaKate Farrow dress with a plunging V-neck in tea rose pearl ($225-240) at Bella Bridesmaids. Rebecca Minkoff pearl to crystal back ear jacket ($29.99) at South Moon Under. Long pendant necklace with triangle in white stone ($22) at Poppy and Stella. Corso Como Penny kitten pump in platinum snake ($129) at Poppy and Stella. 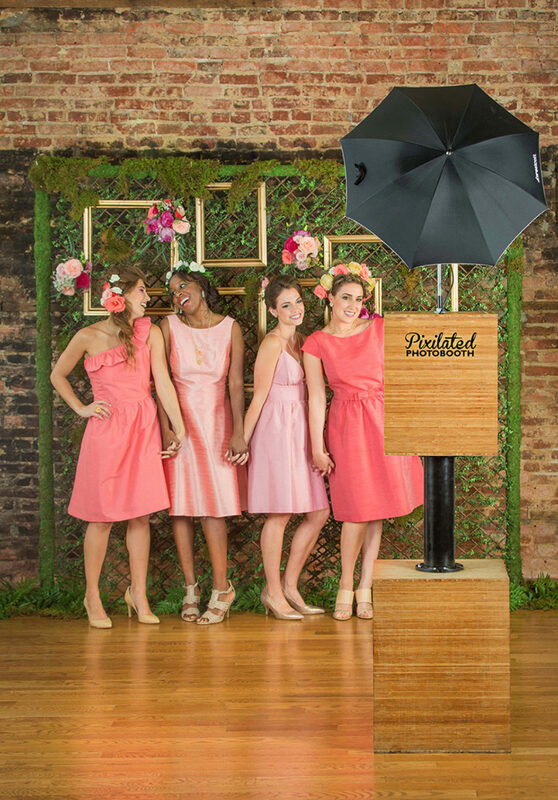 On Alexis: Alfred Sung candy coral dupioni cap-sleeve dress ($198) at Bella Bridesmaids. Text braided curved choker necklace ($19.99) and House of Harlow mother of pearl resin sunburst button earring ($35.50) at South Moon Under. On Aandria: Amsale long pale pink tulle/gauze dress with horizontal ribbing at bodice and sheer neck with an open-twist back ($310) at Garnish Boutique. Jim Hjelm Occasions jeweled belt ($90) from Francesca’s Bridal Salon. Gold metal feather bracelet ($29.95) at Doubledutch Boutique. Pale pink square stone stud earrings ($14) at Poppy and Stella. On Alexis: Jim Hjelm pale mauve tulle/gauze dress with cross-strap neck in primrose ($225) at Francesca’s Bridal Salon. Cayman beaded and sequined stretch belt ($58) at Anthropologie. Crystal flower metal leaf earring cuffs ($24.99) at South Moon Under. Green stone vintage cocktail ring ($20) at Bottle of Bread. On Kristina: Jim Hjelm Occasions tulle/gauze strapless dress with sweetheart neckline in blossom ($255) and Jim Hjelm Occasions jeweled belt ($90) at Francesca’s Bridal Salon. Rose quartz pendant necklace ($16) at Bottle of Bread. Pale gray square stone earrings ($14) at Poppy and Stella. On Emma: Monique Lhuillier pale pink gauze short dress with pleated bodice ($298) at Bella Bridesmaids. Floret tulle sash used as belt ($160) at BHLDN. Crystal fox necklace ($28) at Poppy and Stella. Jules Smith arrow mini stud earrings ($19.99) at South Moon Under. Harriet Wilde Constance D’Orsay silk-satin pumps with pale pink cherry blossoms, crafted from Swarovski crystals and freshwater pearls ($300) at BHLDN. On Emma: Jasmine B2 long, strapless gown with small lace detail ($247) at K&B Bridals. Double cylinder choker ($29.99) and blue lapis triangle earrings ($32.50) at South Moon Under. 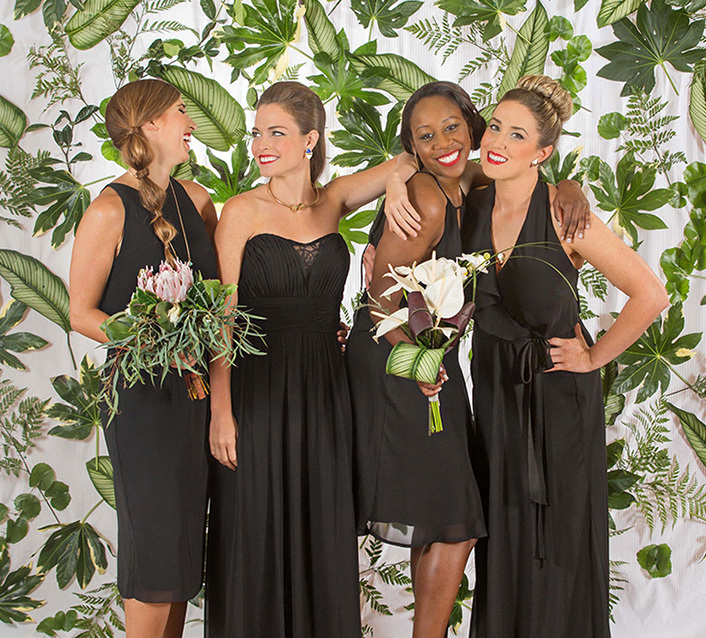 On Kristina: Jasmine Bridesmaids Georgette cocktail dress ($187.50) at K&B Bridals. Ear sweeps ($14) at Poppy and Stella. Gold, blue, and green long pendant necklace ($24) and vintage gold scallop stretch belt ($12) at Hunting Ground. Pour la Victoire Yanni cutout leather lace-up sandals ($249) at Poppy and Stella. On Alexis: Nouvelle Amsale floor-length halter ($220) at Garnish Boutique. Gold and rhinestone square studs ($14) at Poppy and Stella. White and gray stone necklace ($24) at Hunting Ground. On Aandria: Nouvelle Amsale dress with short circle skirt and peek-a-boo V-front and back ($190) at Bella Bridesmaids. Jules Smith three-row vertical bar caged cuff ($19.99) and elongated triangle drop earrings ($32.50) at South Moon Under. Dolce Vita Tyler strappy heels ($99) at Poppy and Stella. 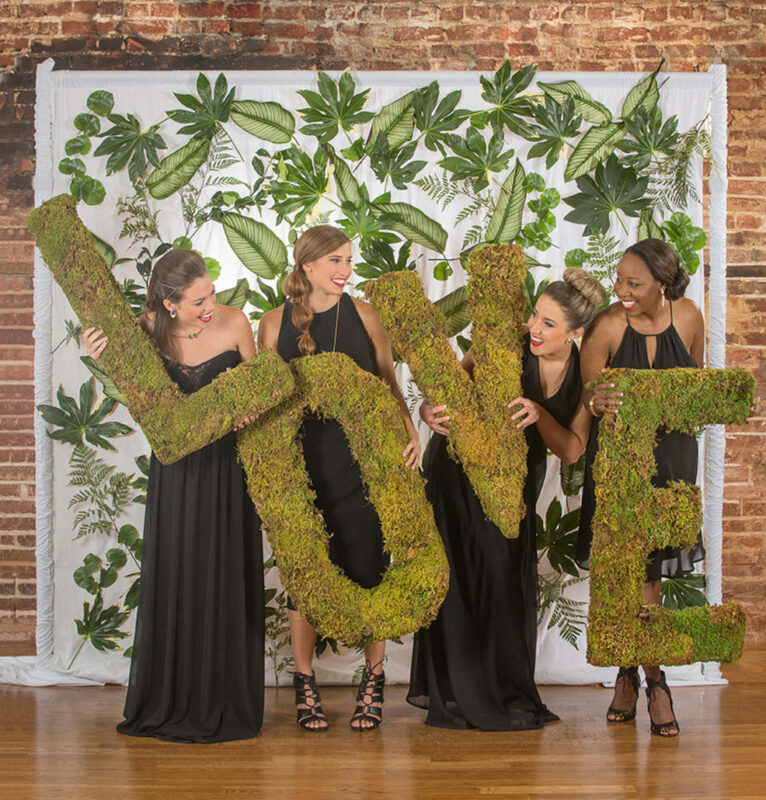 LOVE moss letters created by My Flower Box Events. of MAKETRIBE shares nine prop ideas to up the style of your snaps. 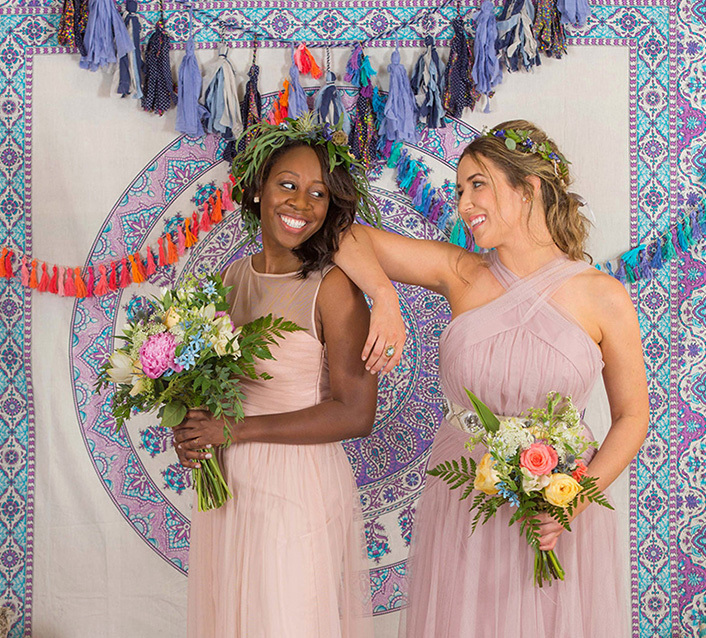 Flower crowns and vine garlands: drape yourself in greenery. Tie-on lace masks: a little mystery never hurt anyone. A slew of costume jewelry: pearls bring the party! Polaroid cameras: so very meta. An armful of ukuleles: make your own album cover. Mylar balloons spelling L-O-V-E: classic and oh-so-cute. A cache of vintage movie-star sunglasses: time for your cameo. Mini superlative chalkboard signs: “Best Dressed” and “Best Hair”? Yep. 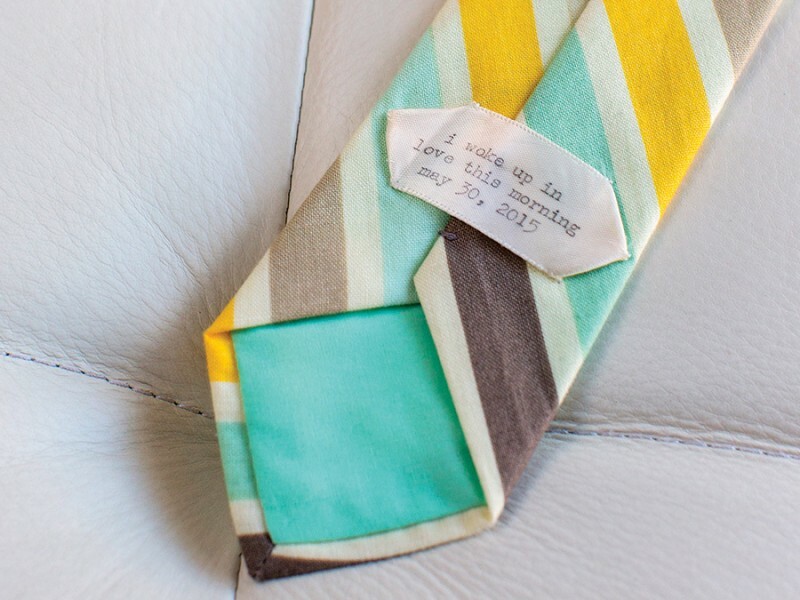 Bow ties on a stick: great for babies, puppies, and swag-seekers alike.